Hello! My name is Tessa. I am eleven years old, In kidlink, I get to write to kids all over the world! I have to give up my recess to do it, but I don't mind. I don't really like going outside, especially since it has gotten cold. I learn a lot of stuff from the different kids, like the sports played in their country, and some traditions, too. The reason I like doing it is probably because I enjoy learning about new people, and I like to go online the few chances I get. One of the projects I have done is about population. I got an estimated guess of Delmar's population from every other kid in the sixth grade kidlink class. I put the guesses on a chart with the person's name, and printed it up. Some of my penpals are Ortal, Ines, and Diana. Ortal is from Israel, Ines is from Portugal, and Diana is from Portugal, too. When Israel's prime minister was shot, I wrote Ortal a letter to comfort her. The first letter I got was from Ortal. Ines's letter is the latest. I have written to some boys named Andre and Filipe, and they taught me about Portugal's tradition and some games that they like to play. They even asked me to explain an American game I play: Broomball. Personally, I think all kids should be able to use the internet, and learn additional things. The Internet should be available to all the kids of the world. I like to take part in KIDLINK because I get to write to people all over the earth. I have a lot of pen-pals. Taking part in KIDLINK gives me a chance to build my skills on the computer. I get to participate in projects and have my name in the paper. I love to write stories and writing with my pen-pals I learn about foreign holidays and a lot about countries I do not know much about. I also get to have live chats with other people from other lands. I learn how to use the computer, how to send mail, and learn about other people. Using the computer has opened windows for me and sending mail has given people something to do, like write back. About other people I learn their age, how many pets they have, and basically all about them. When Mrs. Weeg took us to the Old Mall to write online and let other people watch I got a story starter. I took that story starter and I wrote a 7 page story. Part of my story was posted on "The Writers' Corner" on the World Wide Web. Mr (John) Ost came to Delmar to visit me all the way from New Hampshire. Before his visit he took my eight page story and made suggestions and corrections for the whole thing. The corrections and his comments were 8 or 9 pages long. So I rewrote the story and it turned out great. On Mr. Ost's visit he got a copy of my partly corrected story. I hadn't finished it but on the last day of school I made all the corrections. I was so proud of myself and so was my mother. Many people read my story and loved it. I have written a short story for my reading teacher and the resource teacher at my school has taken it to show other people. I am currently participating in a KIDFORUM project on KIDLINK called, "Hopeful Headlines." It is where I tell about my town and what needs to be done to make it a better place to live. I have not finished this project yet. I have many keypals. One of them is Sergio. He is from Portugal. He wanted someone to write to him, and I was the one who wrote back. I also wrote to ten kids in Israel. They have not written me back yet because they have to translate my letters, and they were long. Sergio wrote me and I wrote him back but he hasn't responded yet. All kids should be able to use the computer whether they are young or old, or big or small. Kids would be able to get friends and information for a report or for their own education. The Internet should be used by all kids and a computer should be in every room hooked up to the Internet. Kids, I think you would love the Internet with all the lovely pictures if they are available to you. 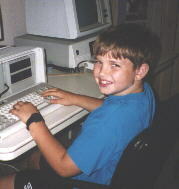 The reason I like to go to KIDLINK at my recess time is because I like to type a lot. In KIDLINK, we are famous because we write a lot about ourselves and about the world. I even got fan mail from one of my readers. I also like to learn new things and in KIDLINK, that is exactly what we do. We learn how people around the world live and how they eat. We also learn about all of the different cultures and holidays. Mrs. Weeg, our computer teacher, tells us about the different holidays and when one of those holidays comes up, she gets a book out about holidays and asks one of us to write about that holiday. Then, Mrs. Weeg puts our items in the KIDLINK Multicultural Calendar. There are many projects that I have done. They are Veterans Day (for the Multicultural Calendar), SS Central America (Shipwreck in the bottle), Writers' Corner (My story), and many more!! I have many keypals. Here are some. Magdelena in Kuwait, Edan in Israel, Jason in Portugal, Susana in Portugal, and a lot more. I learn lots of things like what kind of hobbies and sports they like. I also get information like what they wear and what kind of stores are in their countries. I believe that all kids should be able to go on the Internet because you can learn a lot of information and you can make a lot of friends. I like KIDLINK because I like to type to other kids, like me, from other countries. I learn a lot from it. I learn about other people from other countries and a little about the country. I have written to people far away, and this year I have written a lot about Maryland in a project where we are teaching our friend, Olya, in Russia, about Maryland.So far I have written about the Indian clothes, George Calvert, The Ark and the Dove, and now I am writting about the Pilgrims. You can see it all on the World Wide Web in our Delmar homepages. I have written to other people but I forgot all of their names. YES! I love KIDLINK. My cousin is in it too. We both enjoy it a lot. 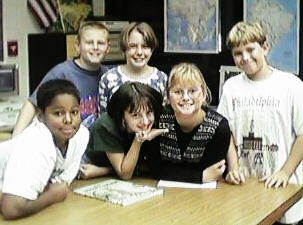 We come to kidlink every day at recess and after school. It's fun to come to KIDLINK because we get to write to people and get e-mail from them. Some of our friends live in Texas, Arizona, Greece, and Portugal. Some of our friends are Michael, Mr. Bill, Oded, Uri, Olya and Susana. They tell us what sports they play and what seasons they are in because not all of our friends live in the Northen Hemisphere. They have different seasons and when they do they tell us and we tell them about our seasons. When we come to kidlink there are many kids that have to share computers. We have 11 computers and 17 kids that come in the afternoon. We give our recess to come to kidlink because it is fun and educational. We also come in the afternoon on Tuesday, Wednesday and Thursday. We get a lot of mail every day and we have to share when we write back to them. Usually we can't answer all of the mail we get because we have only 30 minutes. It is very hard to think of things to write but when we do think of things to write about we can't stop writing. We learn all about the countries of our friends. We also have kidlink on Saturday in the Salisbury Mall at 12:00 noon until 1:00 pm. There we do Kidlink IRC where we can see each other's words came up on the screen. We like to go on Kidlink IRC. We have a friend at NASA who came to see us at school before he left for Australia. His name is Mr. Bill he always writes to us all the time. He is an Australia at this time. He still writes to us when he has time. He's lauching space rockets to study stars that you can only see from the Southern Hemisphere.